Associated Press Connecticut's Napheesa Collier shoots over Notre Dame's Marina Mabrey during the first half Sunday in South Bend. SOUTH BEND – When adversity struck in the national semifinals last year against Connecticut, Notre Dame handled it with poise. When it came back with a vengeance in the national championship game against Mississippi State, the Irish handled it with composure. When it struck on Sunday afternoon in a sold-out Purcell Pavilion in a No.1 vs. No. 2 matchup with No. 2 UConn, the Irish lost their poise and composure, resulting in a 89-71 defeat. Adversity struck for Notre Dame (7-1) late in the third quarter as they went 1 of 7 from the floor and took a 2-minute, 57-second field goal drought into the fourth quarter. UConn (7-0) didn't let up and held the No.1 team in the country to just four field goals in the final period. Arike Ogunbowale, who had the heroic overtime 3-pointer the last time these teams met, was the first to admit that the team lost its poise and she lost her cool, resulting in a late technical foul. The Irish went 2 1/2 minutes without a field goal in the second quarter all while Connecticut hit 5 of 7 and was sitting on an eight-point lead. McGraw called a timeout, and the Irish defense turned it up a notch, forcing the Huskies to go 1 for 6 from the floor to finish the half and cutting the halftime deficit to 44-41. UConn freshmen guard Christyn Williams took over early in the game. The highly recruited player, by both teams, out of Little Rock, Arkansas, was the difference maker. She scored 11 points in the first five minutes, blowing past Irish players on her way to the rim and pulling up from deep. She cooled off in the second quarter but still put on a masterful performance, finishing with 28 points. The Irish locked down Katie Lou Samuelson in the first half, holding the senior scoreless for 20 minutes. Samuelson climbed out of her funk in the second half, nailing contested jumpers and finishing around the rim to end with 15 points. Ogunbowale finished with a double-double of 17 points and 10 rebounds. Jackie Young added 18 and 7. 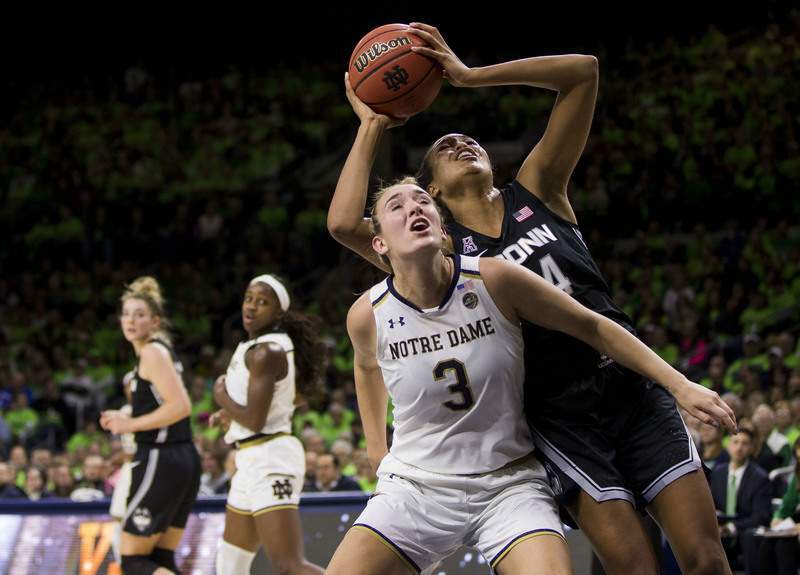 Last time the Irish and Huskies squared off, McGraw's team had to do it without Brianna Turner, who was out with an ACL injury. Having her back is a positive, but the Irish seemed as if they forgot how to use the 6-foot-3 forward. By the start of the fourth quarter, the fouls were piling up for the Irish, the composure was exhausted and UConn had the momentum the Irish usually possess at Purcell Pavilion.